I've been working on a new idea and have read these forums before so thought i'd join the forum and introduce my project and try to find anyone else who has worked on a similar project. 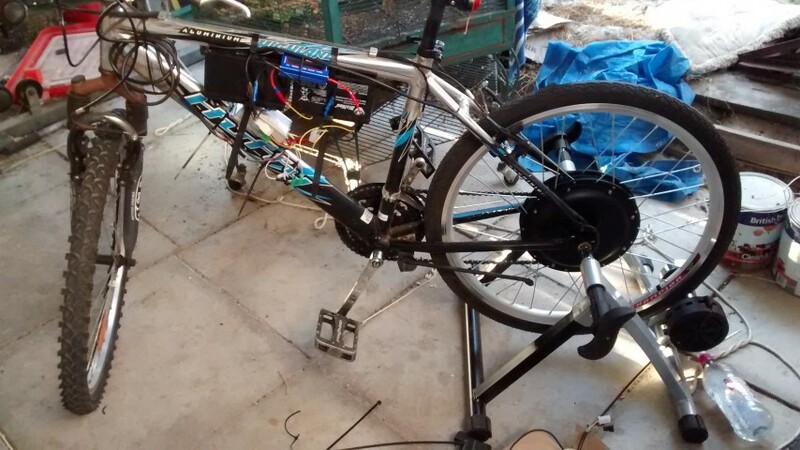 I don't know what the forum feelings around hybrids are - Some time ago, I wanted to build an electric car, but practical issues got in the way, and through a few twists and turns ended up making an electric bicycle, but then went with a hybrid model. 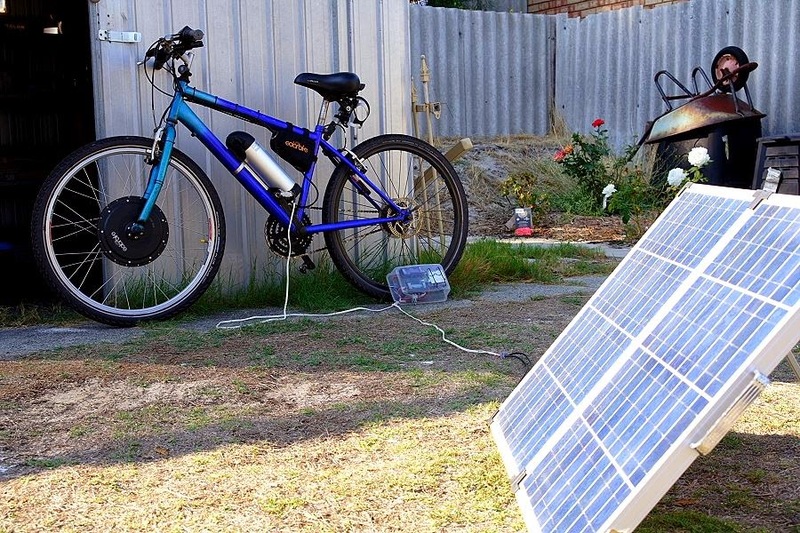 As such, it's an electric bicycle with a petrol generator to charge up the batteries off-grid. 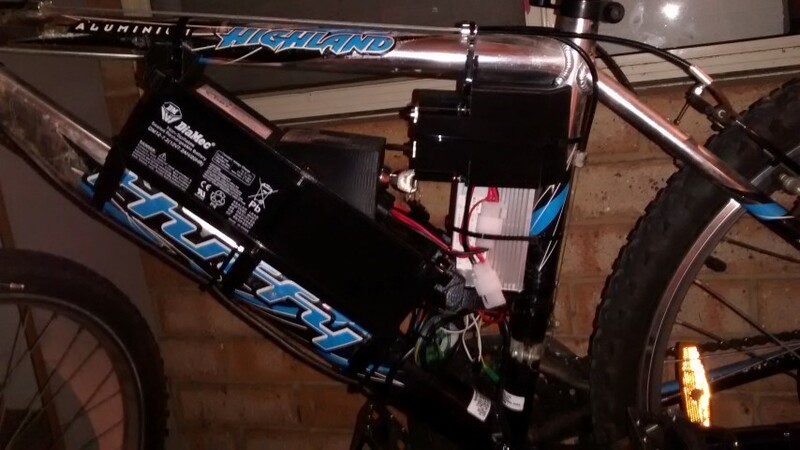 The project was a bit of a challenge, as there's nothing off-the-shelf that's light enough to work with a bicycle, so I designed my own generator system that will charge the batteries, making it a range-extended-electric-vehicle. The generator has enough power to output a kilowatt, but weighs about 5kg all up, so is small enough to fit on a bicycle carrier rack. 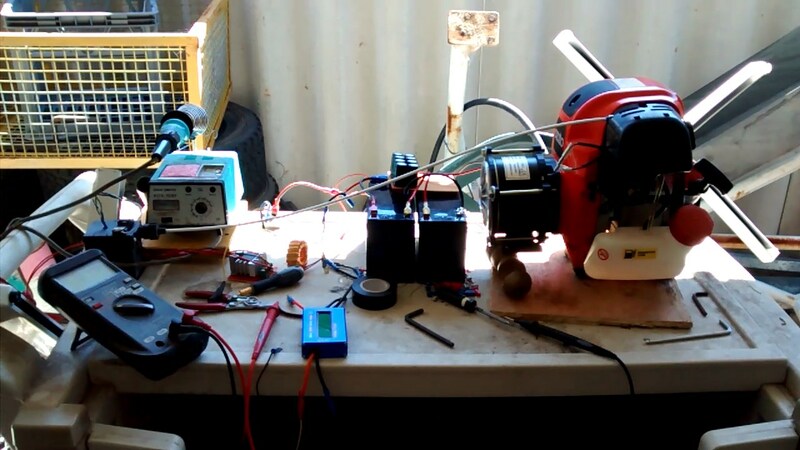 Mostly, output is under 400W as the motor system is only 200W and it's compliant with Australian laws on PAPCs. Range on petrol only is about 150mpg and is around 180 mpg on hybrid mode - so it can run as long as it has petrol, can be charged off-grid and also manually charged. The generator is a "clip on" type, so can be removed. In many ways, I like electric power, but it's not always an option for me - Sometimes I live off-grid and it's all generator, and so there's no chance to charge batteries during non-operational time. Having the capability to not only self-charge, but to self-charge while running was critical. 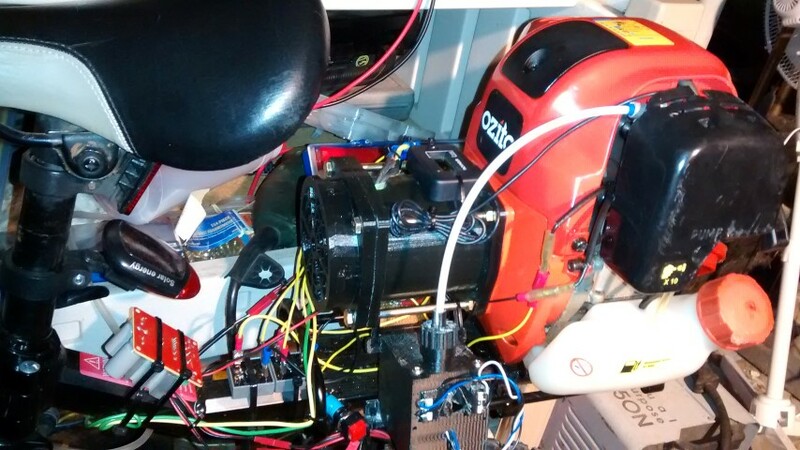 The controller senses the battery condition and will adjust the generator throttle to provide the correct amount of power, running straight into the batteries. It will detect the onset of load from the motor and increase power to provide both charge for the batteries and enough additional power for the electric motor and can be started and shut down as required. I'm currently on the fourth generator model and on the first one to function continuously within the appropriate power bracket, so that it can be ridden normally ( by normally, I mean without breaking, burning out, making too much noise or causing other issue ) - and was designed to have a range that would allow a 60km round-trip commute to work and back from home - I've run it continuously for well over an hour, and it doesn't seem to have any operational issues at this point, so I'm slowly redesigning it to integrate all the external circuits into a single housing. All parts are COTS - except for the controller which is custom and it's pretty efficient in terms of power use, but then it is a very small gen. Testing the original hub motor - downrated from 500w to 125w... ( There's a long story there ). Standard VRLA batteries ( 24v @ 7.2 AH )- Fixed with 3D printed brackets, held with nylon straps - A very solid way of housing them. There is no movement of the battery assembly at all. The controller and batteries all just fit. 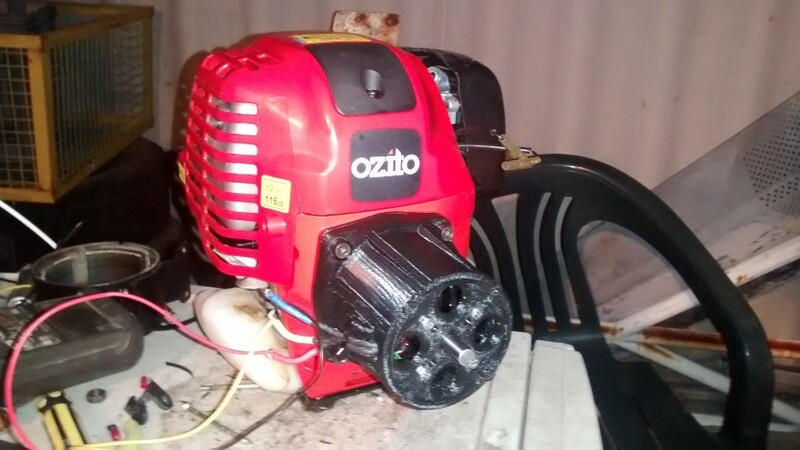 The first fully functional prototype ( Second Gen Generator ) . Third Generation generator ( Failed structurally ). 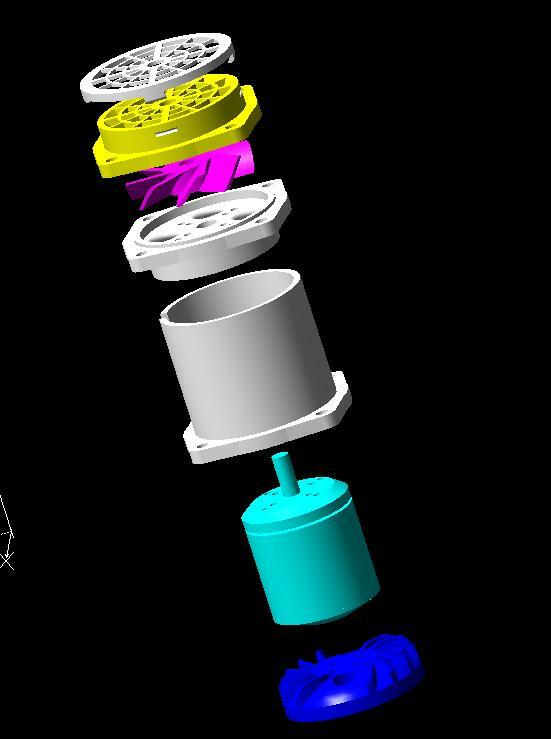 3D printed generator components - exploded view. Current prototype generator for range extension. Anyway, I hope this is of interest to the forum - I guess 1000W is a bit small for most EV applications, but is enough to charge the batteries on many EVs or provide range extension otherwise, well, at least to reduce the rate at which the batteries flatten. Overall, it was a fun project - I'm still working on updates to the design, and the next step is a new ( and different ) clip-on rack so that the system can take heavier knocks while riding. let me guess a RC BLDC outrunner as the generator? Yes, well spotted - I'm using a 3kW motor derated to 1kW with additional forced cooling - It doesn't even get warm enough to feel the heat at 500w, so should handle 1kW with the wire on it - Rated to 1.5kW for 10 minutes without additional cooling and I use a direct-drive ducted fan to force air through the motor @ 5000rpm - though I am without an easy way to test that at the moment... I guess I need a 1kW bicycle. I'll be installing temperature monitors into the motor, but usually I just shut it down then feel for heat coming out through the copper wires, and they are cold to the touch. 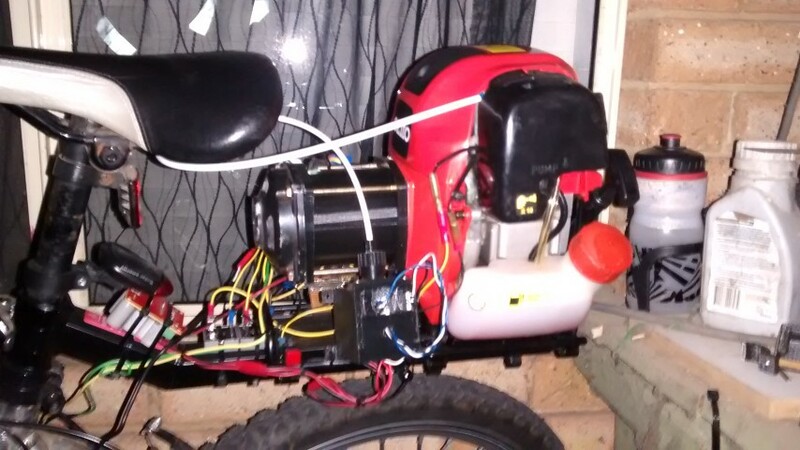 I originally used a bicycle motor, but that burned out so I found a suitable RC model motor that seems to match specifications with what I needed... So I tried it and it worked - The bicycle motor used to get too hot to touch after 5 minutes of low load, so I'm not all that surprised it failed. That looks to be quite a bit of weight hanging off the seat post. How much does the completed hybrid bicycle weigh as opposed to just the bicycle itself? All up including the rear carrier rack? Less than 6kg difference. Given the size of battery pack I'd need to support the range I go, it weighs less than a battery of equivalent capacity - but you are correct that it needs struts on the carrier to take the load - I ride very carefully over bumps at the moment. Last edited by cj7hawk on Tue, 09 Jun 2015, 18:27, edited 1 time in total. I was about to call you a liar when I look at the motor size. There is no way that is less than 200Watts, but you did mention "downrated from 500w to 125w..."
I guess, you've done all of the above because of cost of the battery? I wonder whether not running hybrid (i.e. pure petrol) makes any difference at this engine size. Last edited by Rusdy on Wed, 10 Jun 2015, 12:37, edited 1 time in total. That's a pretty nice looking bike - very clean lines and I do like the solar charger ( I assume you use a voltage booster to direct-drive the battery charge? ) - you did a nice job on the conversion. 125w isn't bad - it still did about 19 kph max, but back-emf killed any chance of going faster. 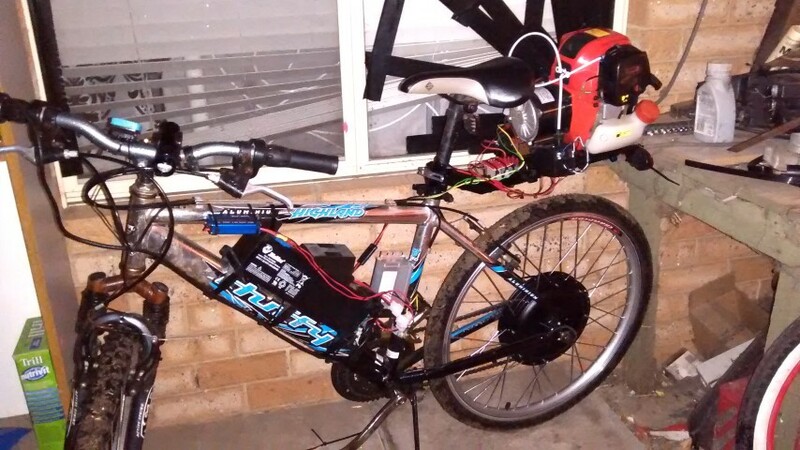 So I modified it to run with a voltage booster and that tries to push 200w through it (max) now, so it sits on about 25 on a flat/level stretch but will take advantage of any downhill gradient or tailwind, as well as adding effectively to pedaling up to 30kph. The 200w max is pre-motor, so there's still some losses there - But it still puts out somewhere between 160 and 180w at the wheel. Pure petrol would probably be more economical, but there's lot of advantages going hybrid - A standing start is one of them, as is good performance at all speeds. Being able to over-drive the motor when the conditions are right is also an advantage, and being able to go silent would round it off. Being able to power decent lights is a big improvement, and they are hardwired to the generator/battery during the day too, so are always running. Also, with better power management, I could store more in the battery and use the ICE motor in it's most efficient manner - That could theoretically double my range, and a computer would just turn the whole thing on and off. What sort of range does that battery get? What sort of daily km are you doing? Must be a lot. I get about 30km out of a $100 lithium battery. I've done the opposite to you with voltage, running a 36v hub motor at 48v to get more speed out of it, but using a cycle analyst to limit the power to 200w. mikedufty wrote: What sort of daily km are you doing? Must be a lot. I get about 30km out of a $100 lithium battery. 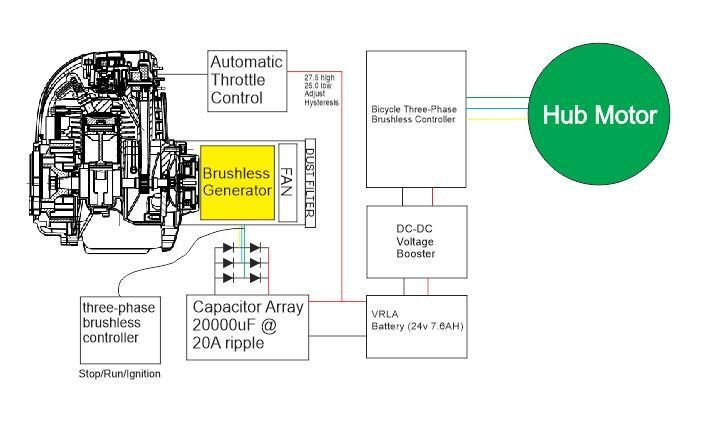 Brushless hub motors cope with PWM with greater losses than the losses with DC boost, but my choice was driven by circumstance more than planning. Still I get pretty good efficiency out of it. I left a switch inline so I can switch back to 125w at any time... Mainly if I need the extra power up hills and I'm out of petrol and relying on the remainder of battery. I did about 55km today for a standard round-trip commute to work and back - first time I tried it, but I'll do it again...I wanted something with about 80km range minimum and I achieved that - but I do have a 500ml "hip-flask" type petrol container to keep me going at the end. I guess I can always go into a servo and refuel if I need to as well. But I'd still like to increase my electric-only range, which at 24v with 7.2Ah lead-acid is only about 10km. I've learned a lot about battery tech while making this project, so might attempt a large battery ( 1.5kWh ) project later. The same generator can always clip to it anyway. It's a clip-on design and can be fitted to a normal bike pretty quick. The cycle analyst is really useful and widely used. Fairly expensive but good value. Actually $60 each now from the Australian warehouse. Pack is 5000mAh 48v so about 0.24kWh. 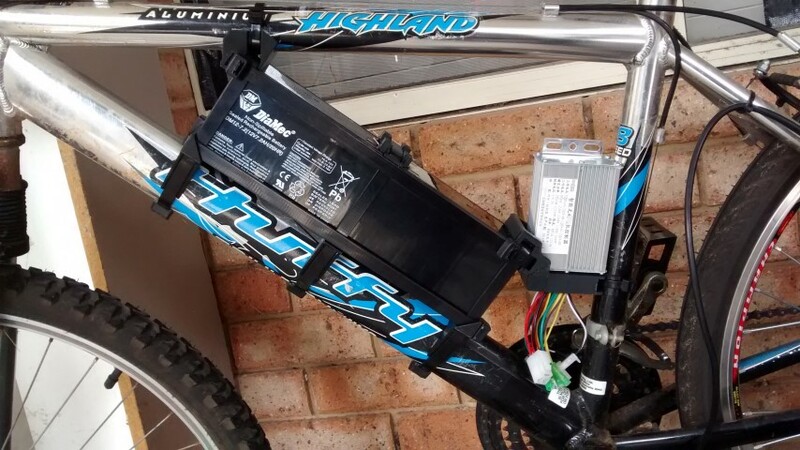 Needs a ~$30 balance charger and a bit more care than lead acid batteries but probably safer than a petrol generator on the rear rack. The 30km range is with substantial pedalling (I average about 25kph without a motor). Could be substantially less without the pedal assistance. It stays close to 200w assistance averaging 30kph, so you'd probably get the same runtime but 5kph slower without pedalling, so about 20km range. cj7hawk wrote: I assume you use a voltage booster to direct-drive the battery charge? Yes and No. I built myself a boost MPPT using Arduino. Me too stingy to buy Genasun boost MPPT. Besides, now I have full control of charging current and stop voltage (at less than half the cost of genasun MPPT). cj7hawk wrote: as well as adding effectively to pedaling up to 30kph. cj7hawk wrote: A standing start is one of them, as is good performance at all speeds. Good point. I didn't think of that. cj7hawk wrote: What sort of range does that battery get? Good question. I haven't dare to test it to the limit. So far, my average is 6.5Ah for 27km. My battery is rated at 11.6Ah. In stormy weather, when the headwind is ridiculous, the record was 9.9Ah for the same distance. Also, I'm not as handyman mechanically as others (i.e. to mount them on the bike safely). So, I can't use the cheap LiPo (like mikedufty). On top of that, I ride regardless the weather. So, I need my battery pack (and the whole system) to be weatherproof. The worst one to date is riding through hailstorm. My face hurts. But the system survived. Last edited by Rusdy on Thu, 11 Jun 2015, 08:00, edited 1 time in total. "The extra battery works a treat. It has also picked up a bit of speed. 54 km in 1hr 34, including stops at traffic lights, road works, head wind, etc. Averaging 33-34 km per hour. No more dramas. Also you can charge both batteries from the one charger. Not sure about range but I'd say I could easily push for 70 km. The pick up in speed/power was noticeable. I am biking home 2-3 times a week depending on the weather. Last edited by Rusdy on Thu, 11 Jun 2015, 08:01, edited 1 time in total. Also, I'm not as handyman mechanically as others (i.e. to mount them on the bike safely). So, I can't use the cheap LiPo (like mikedufty). 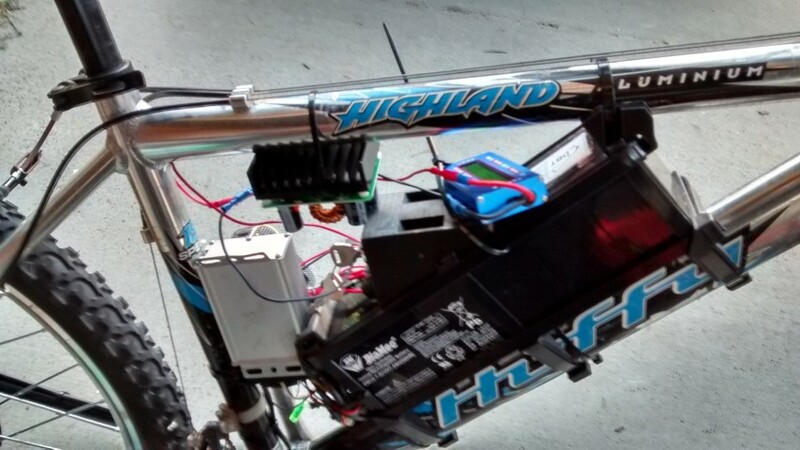 Actually I haven't mounted mine at all, just put them in a fireproof charging bag from hobbyking inside my pannier. I did this to quickly try stuff out, but then decided it was actually a really good setup and have stuck with it. Does back emf really effect the torque arm? I thought that would only apply for regen? I have a geared hub with a freewheel so definitely no backpressure on the torque arm. I didn't think the pennier idea yet. Would play with that in the future. Thanks! The problem is, my motor is at the front wheel. Due to not-so-ideal torque arm (only tight at one direction only), I've decided to make it tight to forward direction only (with pipe clamp). Excessive torque at the other direction (i.e. generated power), I haven't had the guts to try that yet. I'll take a photo next time. Oops, I think I'm not on the same page with you regarding 'back emf', sorry, me physics is not that good too. What I meant by 'back emf', is what you meant by 'regen'. Last edited by Rusdy on Thu, 11 Jun 2015, 13:30, edited 1 time in total. OK I thought regenerative braking was unusual for e-bikes and would only happen when deliberately set up, not when trying to go fast. The geared hub can't do regen because it has a freewheel setup, so if the motor is only connected to the wheel if it is driving the wheel. At over 40 kph it is still pulling 30 or so if the throttle is engaged, which I assumed is enough to keep it spinning at wheel speed, but it is possible the wheel is going faster than the motor. And, of course, the regen braking comes in at any speed, while back-emf only occurs at higher speeds that the motor runs on the battery, and the power is either sucked away by dynamic braking ( same as Regen but without storing power ) or reverse voltage makes it into the battery and you start charging the battery anyway, so the battery becomes the brake. This is the first fully contained design, with everything housed and intended to work all weather - Technologically, it's a slight improvement on the fourth generation, but everything changed slightly - Still uses three fans for cooling. Standard 24v output ( up to 1000 watts ) - Designed to aim for just over 26.2 volts, but can float up to 27.5 max.